Jewish noir–is that redundant? 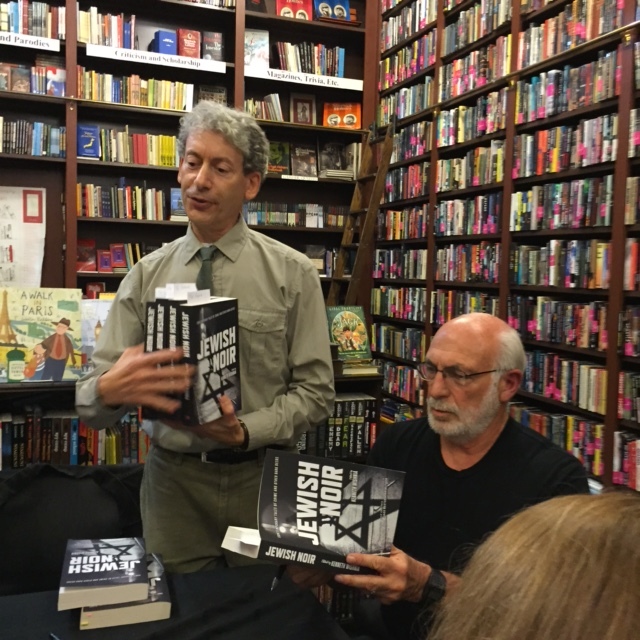 That was one of the questions, raised and debated at the Mysterious Bookshop on Thursday evening, October 1, at the launch party of Jewish Noir an anthology of Jewish themed crime stories, edited by Kenneth Wishnia. Was the Passover Haggada the first Jewish noir? What qualifies a story to be considered Jewish noir? How many Nazi’s do you need in a story to make it noir? To what extent were Jews represented in the noir film industry- in front of behind the scenes? The authors who have stories in the anthology attending the book event included: Reed Farrel Coleman, Melanie Dante, Rabbi Adam Fisher, Heywood Gould, Alan Gordon, Michele Lang, S.J. Rozan, Jonathan Santlofer, S.A. Solomon, Steven Wishnia, Melissa Yi, and Michael J. Cooper. 125 East 85th Street, bet. Park & Lexington Ave.
Broadway at West 84th Street. 85 East 4th St, bet. Bowery & 2nd Ave.